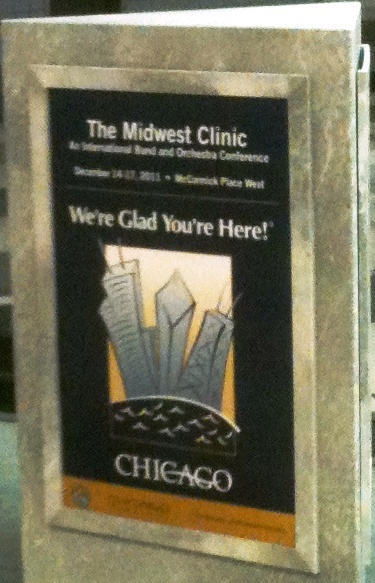 Greetings from The Midwest Clinic! If you’ve been following my blog, you know that I’m in Chicago this week attending the conference, and I hope to provide some daily updates to my readers on the various happenings here. I arrived in Chicago yesterday, and was greeted by the sign to the left in the baggage claim at O’Hare airport – not a bad way to start! From there I made my way to the conference hotel/site, McCormick Place. As there were no real events taking place yesterday, I spent some time acquainting myself with the layout of the conference center. I’ve attended plenty of conferences before, but nothing on the scale of the Midwest Clinic, which boasts an average of 15,000 visitors annually. Size can sometimes take away from the personality of a conference, but despite the number of concerts and events taking place this week things seem to be running quite smoothly. The ballrooms and exhibit halls are massive, but with plenty of clearly marked signs to make navigation very easy. Today was the first real day of the conference, and I tried to pack in as many activities as possible. Things got started at 8:30am with an opening concert featuring chamber ensembles from The United States Army Band “Pershing’s Own.” I was particularly impressed by some great playing from the U.S. Army Brass Quintet (MSG Joseph G. Lovinsky, horn) and U.S. Army Woodwind Quintet (SSG Aaron K. Cockson, horn). They played some traditional favorites for these mediums, as well as some nice arrangements I hadn’t heard before. (More on these in a final post next week). After the opening session I spent some time touring the hundreds of exhibitor booths (at right). I didn’t spend very much time at any of them, but earmarked a few booths to come back and visit again tomorrow. Since I’m not a band director, there were a number of booths that didn’t really apply to me (uniforms, fundraisers, etc. ), but that still left plenty of music, recording, and instrument exhibits to explore, as well as live demos of the latest in music technology. I’ll be spending some more time in the exhibit hall tomorrow, and will report back with more details. The highlight of the afternoon was a concert by the Chicago Symphony brass section. This concert was not in the conference center but a few blocks down at Symphony Center on Michigan Avenue. The brass section played spectacularly, living up to their reputation for both power and finesse. Conductors included Dale Clevenger, Michael Mulcahy, and Jay Friedman, all legends in the brass playing world. The program featured mostly transcriptions, but one of the strongest and most engaging pieces in my opinion was the world premiere of an original brass choir work by Australian composer Paul Terracini. The work was titled Gegensätze, meaning “Contrasts,” and it certainly lived up to its title with plenty of exhilarating moments as well as lots of beautiful lyrical passages. Though obviously difficult, it sounded very idiomatic to my ears, and I think it will be getting plenty more performances in the future. I have some more to say about this concert, but will save that for the final wrap up post next week. To close out the day we were treated to some more fine brass (and wind and percussion) playing, this time by the entire U.S. Army Band “Pershing’s Own.” The band played very well, and one of my favorite pieces on their program was Hail the Dragon! by British composer Philip Sparke. Though he’s most well known in the brass band and wind band world, Sparke has some great stuff out there for horn, including a series of etude books. Ok, that’s enough for now – check back tomorrow for some more updates!